Welcome to the OCMSC web site. The 2019 membership form has been posted at the Forms and Links tabs. Please download, fill out, sign and get it along with the annual dues to me in accordance with the instructions. "The art of racing is not in winning, but in winning so that the rest of the fleet are pleased you have won, and the only way they can be pleased is for you to have shown better helmsmanship than they and also shown perfect sportsmanship." ** Uffa Fox (1898-1972), an English boat designer and sailing enthusiast responsible for many of the developments which have contributed to the modern popularity of dinghy sailing. Thanks to Shoe for bringing this to the club's attention. Final standings for a class are based on half of the total number of races completed during the season. To be eligible for an award you must have completed at least half the races. DNF, DNS and DSQ are not included. Additionally, even though anyone is more than welcome to participate, you must be a club member to be eligible for an award. For 2018 first, second and third place patches will be awarded to both A and B fleet skippers in the US1M, V32, Soling 1M and Dragon Force 65 classes. Points Races for the other classes; Micro Magic, Dragon Flite 95, US12M and Newport 12 were scheduled as informal events for which awards won't be issued. Decisions as to what classes will be sailed and which will be eligible for awards in upcoming years will be based on input from all skippers at the end of the current year. For a given class 5 points races are scheduled throughout the year. At each event 12 races are planned. If all 60 races are completed only the scores from your 30 best races determine your final standing. If, for whatever reason, e.g. rain or no wind, only 54, for example, are completed your final standing will be based your 27 best races, etc. There are no throw outs at the end of any given points race event, that is done at the end of the season, but rankings are posted as bragging rights for the day. A primer that might be helpful for all skippers. 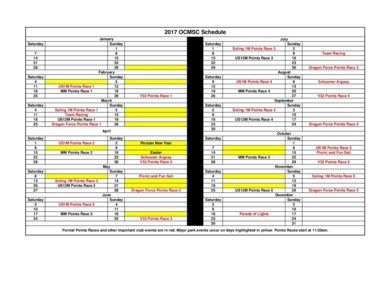 To those of you who wish to learn more about radio controlled sailing, racing, and about our organization, Orange County Model Sailing Club (OCMSC), you have come to the right place. Our regular sailing location is the pond at William R. Mason Regional Park in Irvine, California to which you can get driving instructions by clicking on "View Larger Map" below. We sail almost every Wednesday, Saturday and Sunday from about 10:30 am to 2:00 pm except when we are visiting other clubs on regattas. You are more than welcome to join us and we will be happy to let you use one of our yachts to experience the fun and excitement of radio controlled sailing. To start sailing is relatively inexpensive if you build your own yacht from scratch, buy a kit and build it yourself or buy a used yacht. Our club sails several classes. The US One Meter, Soling One Meter, V32, DragonForce 65, US12, DragonFlite 95, Newport 12, and Micro Magic are the boats we have on our schedule for practice racing and regattas. The Schooners or any boat you would like to bring to the pond are what we sail on the 1st and 3rd Sunday of each month, no racing just a chance to socialize and fun sail. Over thirty classes are recognized by the American Model Yachting Association (AMYA). This 40 year old national organization was founded to further the development of building, sailing, and racing radio controlled yachts. The OCMSC is affiliated with this national organization, and during the thirty plus year history of the OCMSC we have been fortunate to host several national championship regattas and have produced past and present national champions. On a regular basis you can find our members sailing for pleasure and practicing at Mason Park. Besides sailing for fun and practice, we host scheduled regattas/points races every month of the year, where other club members are invited to race for glory. Radio controlled sailing is a wonderful way to spend time relaxing from the everyday pressures of life. OCMSC is made up of people from all walks of life. We are a family oriented group and welcome family involvement. Please come down to the Mason Park and get to know our members, sail our boats and become familiar with the sport of radio controlled sailing. Number of homepage hits since the site was created July 25, 2010.